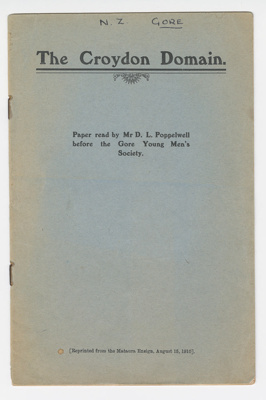 This is a lecture paper delivered by Dugald (D.L.) 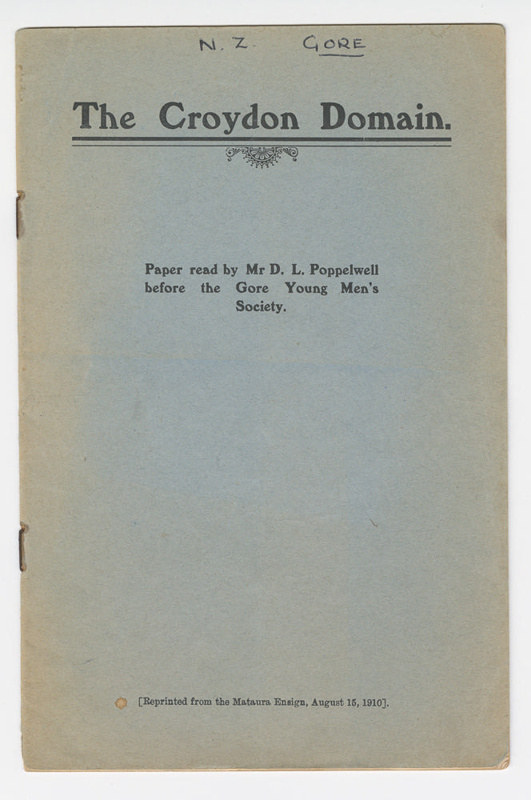 Poppelwell, early environmentalist and Mayor of Gore, to the Gore Young Men’s Society in 1910. The paper discusses the Croydon Domain, detailing its: history, climate, ecological condition and distribution of trees, the influence of altitude, trees, bird life, bush flowers, preservation of the bush and possible future improvements for the Domain. It was reprinted from the Mataura Ensign on August 15, 1910. Poppelwell was responsible for lobbying the then Government to set aside 200 acres of bush to create the Croydon Bush public reserve. This reserve has been since grown to 2,334 acres. Our online entry for for Poppelwell's top hat more fully chronicles his significant contribution to Eastern Southland.